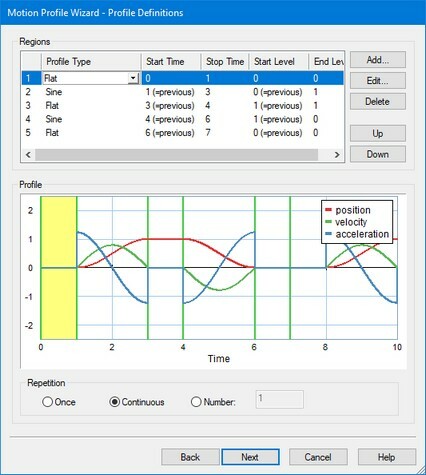 The 20-sim Motion Profile Wizard helps you to define motion profiles. To generate such a profile, follow the next steps. 1. Open the 20-sim model library an go to the section Signal\Sources. 2. 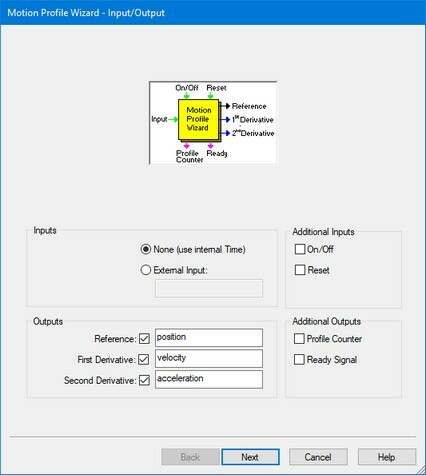 Drag and drop the model MotionProfileWizard.emx to the editor. 3. Select the model and click Go Down. This is a masked model. 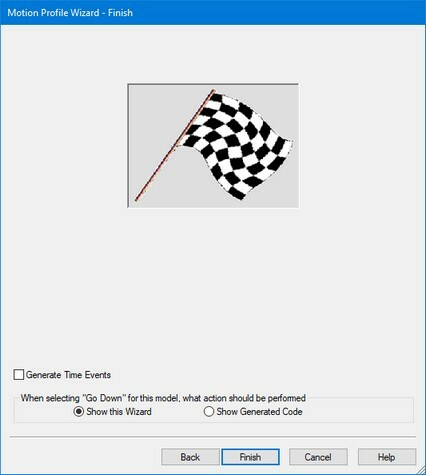 Clicking Go Down will open the Motion Profile Wizard. • External Input: Normally the time will be used for the x-axis of the profile. You can however use an external input as x-axis variable. • On/Off: Use this input signal to start (onoff = TRUE) and stop (onoff = FALSE) the profile. • Reset: When the reset signal gets high (reset = TRUE) the profile will be started. • Reference: The motion profile reference signal, e.g. position. • First Derivative: The first derivative of the motion profile reference signal, e.g. velocity. • Second Derivative: The second derivative of the motion profile reference signal, e.g. velocity. • Profile Counter: Gives the number of profiles that have been generated. • Ready Signal: Gets high (ready = TRUE) when the profile is completely generated. 5. Click Next to enter the desired profile. 6. You can enter as many profiles as needed to design the complete motion. You can choose out of a number of predefined profiles. 7. Choose the number of times the motion should be repeated. 8. Click Next to go to the last page. In the last page, you can choose to generate Time Events and what to show the next time (the wizard or the generated code). Use the default settings if you are not sure what to use. 9. Click Next to go to close the Wizard. 10. In the Editor from the Model menu Check Complete Model to make the changes effective.